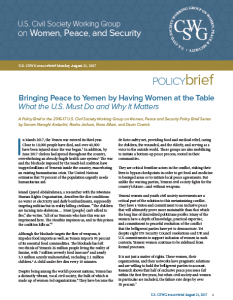 A Policy Brief in the 2016-17 U.S. Civil Society Working Group on Women, Peace and Security Policy Brief Series by Sanam Naraghi Anderlini, Rasha Jarhum, Rana Allam, and Devin Cowick. As a critical member of the coalition supporting Saudi Arabia, and with its global diplomatic reach and influence, the United States has the capacity to take decisive, life-saving actions to end the war. Moreover, it can propel negotiations to reach a sustainable peace by encouraging, enabling, and modeling an inclusive approach that draws on the expertise, commitment, and strengths of all actors: those using violence and those brave enough to wage peace. This brief examines and reflects on existing efforts to enable the participation of civil society voices, notably women, in Yemen’s formal negotiations. And it provides practical recommendations to the U.S. administration and Congress on steps needed to reach peace in Yemen.